Polyurethane tread and Solid Polyurethane wheels are not affected by grease, oils, most chemicals & cleaning solutions, brine or blood. They offer a smooth effortless ride, are non-marking and protects floors. Pemco KasterKat Shopping Cart Wheel 5"
Best Selling Pemco PolyKat 5" Shopping Cart Replacement Polyurethane Wheels fit most shopping carts and are a quality replacement option. Pemco Anti Static PolyKat 5" Shopping Cart Replacement Polyurethane Wheels fit most shopping carts and are a quality replacement option. 5" x 1-1/4" Pemco KasterKat Premium 5" Shopping Cart Replacement Polyurethane Wheels fit most shopping carts and are a quality replacement option. 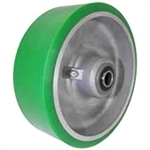 Polyurethane on Aluminum Mag Wheel Green 6"x 2"
Polyurethane on Aluminum Mag Wheel Green 8"x 2"
Polyurethane on Aluminum Wheel Blue 3"x 1-1/4"
3" x 1.25" Blue Polyurethane on Aluminum Wheel Annular Ball Bearing 3/8 I.D. Polyurethane on Aluminum Wheel Blue 3-1/2"x 1-1/4"
Polyurethane on Aluminum Wheel Blue 4"x 1-1/4"
Polyurethane on Aluminum Wheel Blue 5"x 1-1/4"
3.5" x 1.25" Blue Polyurethane on Aluminum Wheel Annular Ball Bearing 3/8 I.D. 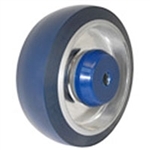 4" x 1.25" Blue Polyurethane on Aluminum Wheel Annular Ball Bearing 3/8 I.D. 5" x 1.25" Blue Polyurethane on Aluminum Wheel Annular Ball Bearing 3/8 I.D. Polyurethane on Aluminum Wheel Green 4"x 2"
Polyurethane on Aluminum Wheel Green 5"x 2"
Polyurethane on Aluminum Wheel Green 6"x 2"
Polyurethane on Aluminum Wheel Green 8"x 2"
Polyurethane on Cast Iron Wheel Green 10"x 2-1/2"
Polyurethane on Cast Iron Wheel Green 10"x 3"
10" x 2.5" Green Polyurethane on Cast Iron Wheel Roller Bearing 3/4" I.D. w/ Spanner. 10" x 3" Green Polyurethane on Cast Iron Wheel Roller Bearing 3/4" I.D. w/ Spanner.